Copies the current VisualObject and returns a pointer to a new VisualObject. Returns the identifier of the object item. Adds data to the object. Deallocates the data if there has been data allocated. Returns the number of bytes currently used by the internal data buffer. Returns the declared size in bytes of the object. Sets the declared size in bytes of the object. Returns whether the declared data size has been set yet. Returns a shared pointer to the visualObjectData. Notification that the loading of data ended. Answers the question whether the internal data buffer has data available. Returns a pointer to the internal data buffer. Returns the number of bytes of the internal data buffer. Copy method for assignment operator and copy constructor. Basic abstract object data type of core objects. anIdentifier Identifier of the object. other Reference to another VisualObject. dataSize The number of bytes of the dataPtr. Implemented in VizKit::VisualString, VizKit::VisualFile, VizKit::VisualTextAutoScrollView, VizKit::VisualAsset, VizKit::VisualAnimation, VizKit::VisualImage, VizKit::VisualNotification, VizKit::VisualAnimationCluster, VizKit::VisualAnimationSequence, VizKit::VisualStyledString, VizKit::VisualStringStyle, and VizKit::VisualAnimationComponent. identifier The identifier of the data load request. Hook method that can be overridden by subclasses of VisualObject for post-processing of received data. 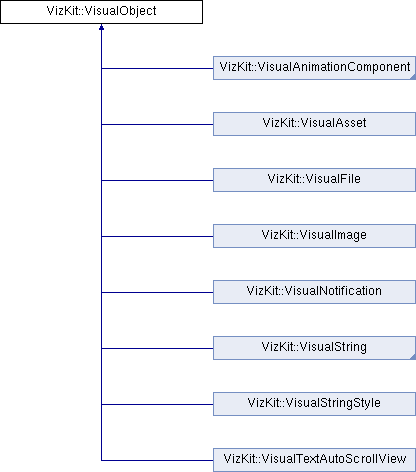 Reimplemented in VizKit::VisualString, and VizKit::VisualImage. Boolean flag answers the question whether the declared data size has been set yet. A pointer to the internal data buffer. The number of bytes of the internal data buffer. The declared size in bytes of the object. The size can be declared by a remote header file before the actual data has been fetched. The number of bytes currently used by the internal data buffer. The identifier of the object item. A shared pointer to the visualObjectData. The caller has to call release() on the visualObjectData pointer after use. True if the internal data buffer has data available, false otherwise. The less than operator is used by std::map for find() and sorting (if VisualObject is used as key_type). aDataSizeDeclared The number of bytes declared.